I'm really close to wrapping up, typing up the interview I did earlier this year with David Paich and I have to tell you, I think you'll really enjoy this one.! I'm really truly sorry with the lack of updates. you have had, but hopefully things will get to a better situation and I can keep more up to date on here. Meantime, here's a few updates. 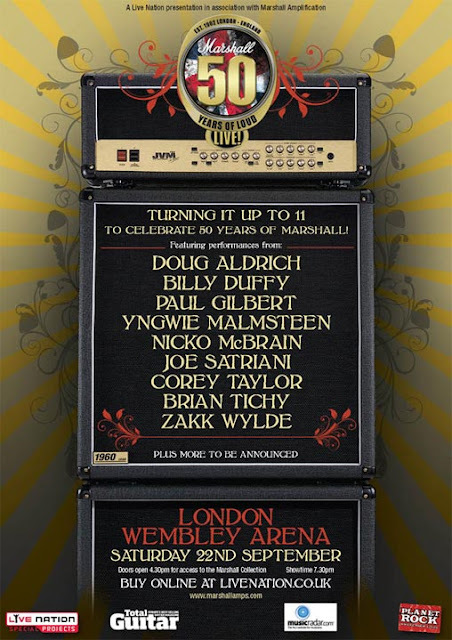 To celebrate 50 legendary years of musical innovation, Marshall Amplification is taking over Wembley Arena with for night of full on rock and roll on Saturday 22nd September to celebrate the iconic amps and the life of the late, great Jim Marshall. The Pub Landlord, Al Murray, and Maiden's Nicko McBrain will be on hand to compere the event along with Planet Rock, will be joined by the world’s most legendary guitarists, acclaimed musicians and Marshall enthusiasts including multiple Grammy nominee and Chickenfoot super-group founder Joe Satriani, Ozzy Osbourne collaborator and founder of Black Label Society Zakk Wylde, technical wizard and one of GuitarOne magazine’s "Top 10 Greatest Guitar Shredders of All Time" Mr Big’s Paul Gilbert, bass legend Glenn Hughes, Whitesnake’s Doug Aldrich and Brian Tichy, Swedish virtuoso Yngwie Malmsteen, The Cult’s Billy Duffy and Slipknot/ Stone Sour front man Corey Taylor . There are also further big names to be announced. And the line-up for Marshall Amps 50th Anniversary event just got louder with the addition of more names to the already storming line-up. Dream Theater’s drummer and progressive metal legend Mike Portnoy joins hit songwriter and founding member of Free, Andy Fraser and all-round thrash metal superstar and co-founder of Slayer Kerry King for this rock n roll spectacular. Championed in his homeland as the most renowned guitarist in all of Asia, Tak Matsumoto is primarily revered as chief songwriter, GRAMMY WINNING guitarist and producer of the Japanese rock band, B'z. Counting a legacy of 18 albums, "B'z" truly means big business! With combined sales totaling over 80 million units in Japan alone, Tak's artistic vision has easily made them Japan's best-selling band in history. As a soloist, 2002 served as a landmark year for Tak with the Japanese release of his much heralded instrumental albums, "Hana" and "Dragon from the West". Hana garnered rave reviews for its powerfully flowing melodies evocative of scenic horizons of the Orient. The album's bonus track, "Trinity," finds Tak stretching the boundaries of "rock" guitar, blending different tastes in the melodies while retaining the same distinctive Japanese spirit. In 1999 he became the first, and to date, the only guitarist from Asia to be given his own Signature Model Les Paul by Gibson and added to Gibson's signature artist club. 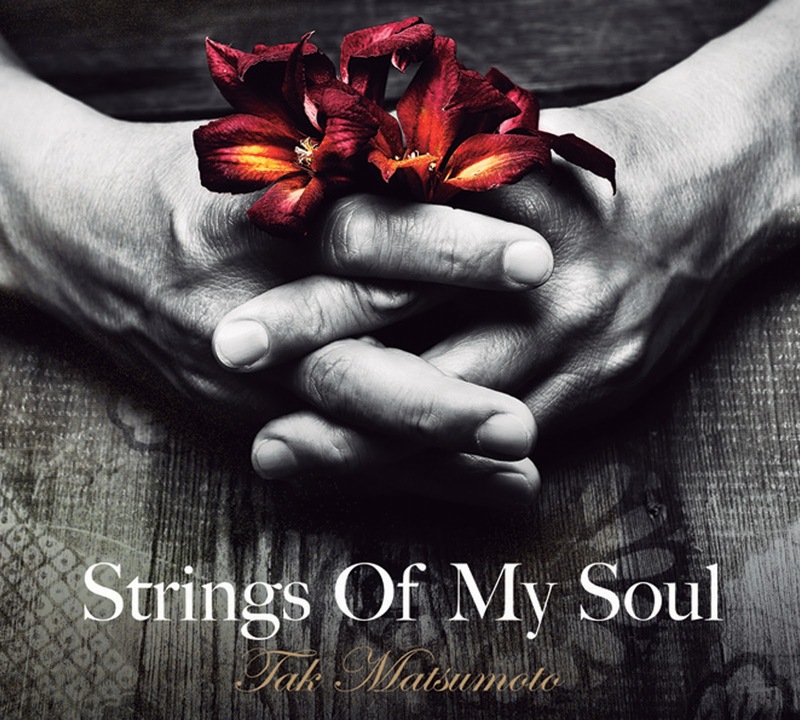 "Strings Of My Soul" marks the second time Tak has released a solo project outside of Asia (the first was "Hana" in 2003). Audiences everywhere will fall in love with these beautiful melodies inspired by Tak's Eastern influences. This eclectic album mixes Jazz, Blues, Rock, and features a cover of "SUKIYAKI" with the special guest appearance of 4-time Grammy Winning guitarist Larry Carlton. In addition, producer, artist, and two-time Grammy winner, Paul Brown lends his talents to this great record. Tak first teamed up with 335 Records in 2010 when he released "Take Your Pick", a collaboration with Larry Carlton. This release would prove to be a knock-out and went on to win the Grammy for "Best Pop Instrumental Album" at the 53rd annual Grammy awards earning Tak not only his first nomination, but first win. "Strings Of My Soul" entered at #4 on Japanese Charts in its debut week. According to Metallica's Lars Ulrich, the band will enter the studio in September to start recording a new album. In a conference call with reporters, Ulrich said front man James Hetfield was coming up with some great ideas. "Every time [he] picks up a guitar there's some brilliant riff that comes out of him. I try to make sure that they're all recorded and try to do my best to keep up with them and try to put some drums behind them." Their last release, 'Death Magnetic' was released back in 2008. DUBLIN RETURN - The exihibition that pays tribute to Phillip Lynott, the man and his music the 'Philo Exhibition' has returned to Dublin from London's O2. Following a highly successful London O2 run, 'Still In Love With You: The Philip Lynott Exhibition' returned to the Stephen's Green Shopping Centre in Dublin, Thursday July 19, where it previously ran, with huge success, for a staggering eight months. The highly acclaimed exhibition, which brought visitors to Dublin from all over the world last year, garnering rave reviews along the way, will now return to Dublin for the months of July, August and September 2012, with a programme of events being lined up to bring additional fun and entertainment to the run. As lead singer with the legendary Thin Lizzy, Philip Lynott's powerful music reverberated around the world. The Philip Lynott Exhibition attracted tens of thousands visitors to Dublin and London from Russia, Germany, France, Spain, Italy, Sweden, Norway, Denmark, Serbia, Japan, Brazil, Argentina, the USA, Canada and many more countries across the globe, as well as from all over the UK and Ireland. Now, in "Still In Love With You – The Philip Lynott Exhibition", rock enthusiasts, music fans, families and visitors to Dublin alike can get another opportunity to take what is an emotional and inspiring journey through the life and times, the music and the memories of a phenomenal rock star and romantic. We want to tell all the FANTASTIC DIO FANS around the world the AWESOME NEWS about the new CD coming out this Fall WORLDWIDE!!!! Drum Roll Please!!!! Dio Fans, I'm happy to tell you that we are releasing "The Very Beast Of Dio Vol. 2!" I also have some TOP SECRET NEWS!!!!! There are 3 BONUS TRACKS that will be on this CD!!! We aren't releasing the track listing yet, but I can tell you that ONE of the BONUS TRACKS has NEVER been on a Dio CD before and ALL FANS WANT IT! We absolutely know that every single Dio Fan is going to want "The Very Beast Of Dio Vol. 2!!!!" Just to let you know, the first "Beast Of Dio" was only released in the USA and Canada only and has sold over 800,000 CD's to date! This CD will be in EVERY COUNTRY and our Dio Store too! LEGENDARY Artist Marc Sasso has made one of the greatest CD covers for "The Very Beast Of Dio Vol. 2!" Marc is an AMAZING Horror Artist! He did two Dio cover, "Killing The Dragon" and "Master Of The Moon!" Marc has also done covers for Judas Priest, Fight, Two, Rob Halford and is a TOP Video game designer! The cover is so SICK!!!!!! International metal giants Loudness will release their new album EVE TO DAWN on August 14th via FrostByte Media. EVE TO DAWN marks the legendary Japanese band's 26th studio album since their inception in 1981 (Loudness just celebrated their 30th anniversary last year). EVE TO DAWN is a spectacularly heavy opus from the "beast from the east" and is Loudness' first North American release in years. Known for their blistering technical ability, Loudness was formed in Japan in 1981 by guitarist Akira Takasaki and late drummer Munetaka Higuchi. With four very successful and critically-acclaimed albums under their belt in their native Japan, Loudness became the first Japanese heavy metal band to sign to a major label in the United States. With an astonishing 26 studio albums, numerous EPs, live albums and videos, Loudness show no signs of slowing down as the band continues to tour the world extensively in support of EVE TO DAWN. To date, Loudness has sold upwards of one million albums worldwide. Loudness is: Minoru Niihara (vocals), Akira Takasaki (guitars), Masayoshi Yamashita (bass guitar) and Masayuki Suzuki (drums).